Q: Choosing Your First Event? A: Events vary in size and nature from small displays, to large battle re-enactments involving thousands of the Society’s members. There is no ruling on what you choose as your first event, but check what events the Regiment are attending, so at least you’ll know who to look for. Easiest way to see what events the Regiment as a whole are attending is to check our Events Calendar or keep updated via the Regiments Facebook page. Directions and information for the events you have chosen will be published in Orders of The Daye, the Societies magazine..
On approaching your event look out for SK sign this will guide you to the campsite, at the entrance of the campsite there will be a manned tent to greet arrivals who will greet you with a warm welcome, you need to give Proof of membership in the form of your membership card, once you have been identified you will be provided with a muster guide for the weekend and a black bin bag for your weekends rubbish. The gate guard will ask you your Regiment and Tertio, your Regiment is: ‘Earl Rivers’ Regiment’ who are in The Oxford Army, directions to your camping area will be shown on the guard tent map. When you arrive at the Tertio camping area our campsite area is marked by the Earl Rivers board. If you become lost just ask, the society is like one big family, everyone is friendly. Once you have arrived and introduced yourself there are normally willing hands to help you set up, and provide you with a cup of tea or coffee. Q: Can we borrow kit for our first event? A: To insure that you can enjoy your hobby straight away without too much expense our quartermaster can lend kit you free of charge for your 1st event, we also provide you with the appropriate weapons for you to use at all events. Q: What is Needed to Take Part in a Muster? A: Tents, Caravans and Camper Vans are allowed. If you have camped before then you will know what equipment and accessories you will need, but again be warned that there is no ‘power-points’ to the campsite, there are basic facilities on site like fresh water points and porta-loo’s the get regularly cleaned. If you haven’t camped before then you will need a tent, sleeping bag/air mattress/blankets etc, loo roll, torch, food and cooking utensils, camping cooker (There are food stands but they are not open 24/7 and not all take-aways will deliver to site.) wet weather gear and a sense of humour if the weather turns against us. Your 17th Century kit needs to come with you as well. Many members change into their kit when they arrive and do not change out until they leave for home, some go home wearing it (Some even arrive in kit!). The choice is yours. Q: What Will I be expected to do at my first event? A: Every Muster is different although at a Major Muster it usually follows that there is drill practise or cameos in the morning, followed by a rough lunch time and form up about 2 pm ish. The battle normally kicks off about three, lasting for an hour or two depending on the script of battle. 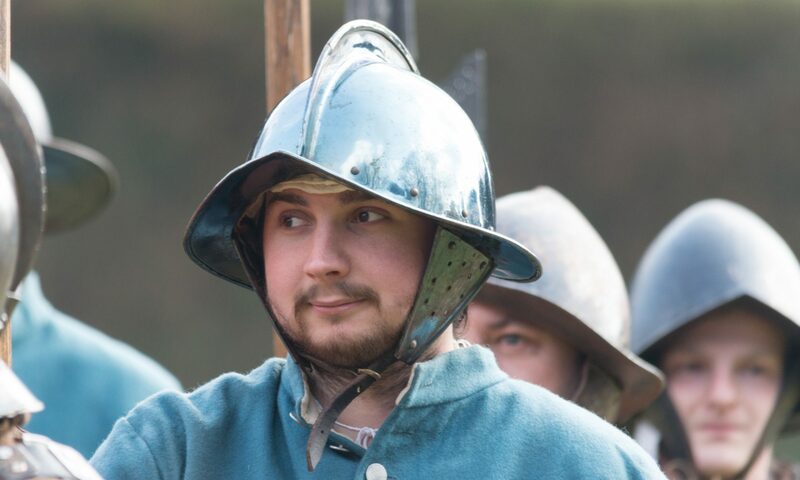 If you choose to take part in the Living History encampment or join in with the Apprentices you may end up spending the whole day there from mid morning to late afternoon. Then the evening is yours. Traders row is open all day except for when the battle is on. The large beer tent has its own opening hours, but can be used as a gathering place depending on the location. The battle days are usually on Saturday and Sunday or if it should be on a Bank Holiday then the battle days change to Sunday and Monday (and occasionally the Saturday as well). If you have work priorities that mean you have to work on a weekend day, you can always come to the battle on the other day. Mini events are time tabled by the Host Regiment, but you are made well aware of this time table before the event. Many of the Regiments gather together after the battle/evening and share maybe a meal and a few drinks. Others like to go into the nearby towns for socialising, while others head for the beer tent. Again the choice is yours. Please do not think this is a male orientated hobby, a large potion of the Society are women who take roles from Senior Army Officers all the way down to common soldiers as well as camp followers and yes, they have a habit of fighting harder then the men!